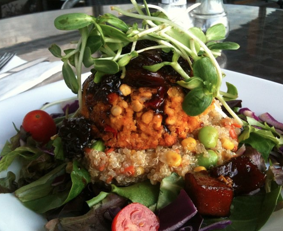 Some of our menu items are available as vegan options. Our vegetarian and vegan friendly dishes can be customized to suit your taste. Check the Specials of the day, too! 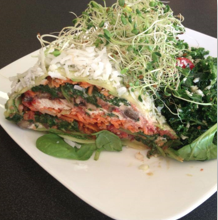 Almost every day at Simon’s we are able to have a Raw Food Option, this Raw Lasagne has no animal products so is made purely with vegetables and nuts, so creative. Hello. Do you offer gift certificates? We don’t have a menu but we have gluten free baked bread from a company called sammis. It’s located in st peters burgs. It’s a bread not made with wheat but is made within a facility that processes wheat. Do you have breakfast food other than pastries? Yes we have a full breakfast menu served from 8 a.m. To 11 a.m. I love your place. Where do you get your chicken breast from? We have it sent from Ashleys farms , that’s the only chicken breast we will use! Yes we do , we make all specials in house and dressings also soups so we know exactly what is in our food, we do use brags aminos in a lot of our food for flavoring . Attended the raw lasagna cooking class with Chef Mike last Friday – loved it! For anyone that has not tried that dish I suggest you do, it is absolutely delicious. Hello, Are you hiring servers now or by October? Hi, what would you say your best seller item is? Sorry for the tardy response. We have so many top sellers but to name one we would say the “Tex Mex burger”. Every day we handcraft black bean burgers from fresh cut vegetables, black beans and floured oats. Our burger bun is made fresh every morning by our baker friends two doors down. We strive to bring fresh whole food so every ingredient is of highest quality. He Tex mex burger is a black bean patty topped with pepper jack cheese, avocado, lettuce, tomato, onion and vegannaise on an artisan focaccia bun. Thank you and excuse us again for the tardy response. Hi! Do you all sell a selection of ready-made meals for people to take home? Are you on Instagram? I’ve been looking for your Instagram and cannot find it. If not, that is so unfortunate. You have such amazing food. Your Instagram could be fire! Hope you consider putting one up. People are already hashtagging food from your coffee house on Instagram. Everyone else should know about Simon’s; your food is incredible!